The Irish Brigade, raised by Casement from Irish Prisoners of War in Germany, is hard to research as none of those involved seemed to want to be linked to the Irish Brigade after the war. Neither the men nor their families, nor their regimental histories, nor the British Army nor the British nor the Irish governments, nor the Republican organisations. The whole enterprise sank into obscurity. Nobody wanted to know. Some of the men left memoirs but very little was actually printed, and their own stories have remained hidden in attics or thrown out as rubbish. Casement had been in the United States when war broke out, and he travelled to Germany with support from various Irish-American groups. He arrived in Berlin on 31st October 1914. Soon after his arrival, on Nov 2nd 1914, he had an interview with Zimmermann, State Secretary for Foreign Affairs. Among the points agreed was the moving of Irish prisoners of war to one camp, Limburg. The mechanics of creating a special camp for Irish prisoners and actually moving them there happened remarkable quickly, with over 2000 Irish prisoners moved to Limburg by Christmas 1914. 1914 Dec 6. In a letter to Count Wedel, his day to day German Foreign Office contact, Casement states that he had visited the Limburg camp. This appears to have been his first visit. 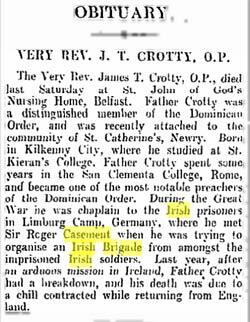 He went to see the priests who had been sent to minister to the prisoners, at this point Crotty and O'Gorman. O'Gorman left a few days before Father Nicholson arrived. Casement stayed at Limburg for 4 days, leaving for Berlin on 10th Dec. Only small numbers of Irish prisoners had arrived at Limburg by this time, but not the main group of some 1500 who arrived 17th December. Quinlisk and MacMurrough appear to have been the only men to approach Casement with a view to joining an Irish Brigade after this foray into Limburg. 1914 Dec 17. 1500 Irish prisoners, including Michael Keogh, arrived in Limburg. There were already earlier Irish arrivals from other camps, primarily Doebritz bei Berlin and Neustadt an der Ashe. Keogh records that they were housed in "fine" wooden huts at Limburg, with 50 men to the two rooms in each hut and "beds on wooden trestles and sufficient blankets". By early January 1915 Casement is citing 2200 Irish prisoners in Limburg. But from the start there was resistance to Casement. The senior British NCOs sent a message to the camp commandant stating that they wanted no special treatment as "in addition to being Irish Catholics, we have the honour to be British soldiers". Some recruits like Sgt McMurrough of the Leinsters appear to have come and gone on deciding that the rewards were not good enough. Casement's negotiations with the German government resulted in an agreement for the Germans to supply arms and ammunition to Irish republicans, to support an independent Irish government, and to authorise the formation of an Irish Brigade, raised from Irish Prisoners of War in Germany, in the German Army. This treaty was signed on 23 Dec 1914 by Casement and the German Foreign Office. With this document as his foundation, Casement set out to get his recruits from mainly Irish regular soldiers captured in 1914 and early 1915. 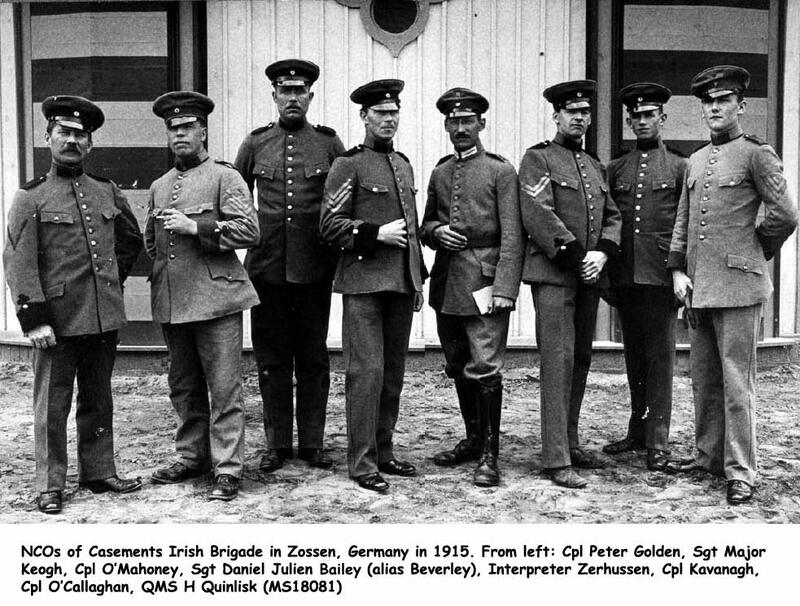 Recruiting stopped when the 55 recruits were moved to Zossen in July 1915. After that they only attracted one more recruit, Wilson in early winter 1915. 1915 Jan 23. Father Nicholson, a Roman Catholic priest sent by Irish American interests, arrived at Limburg from the end of Jan 1915 and stayed until mid June 1915. For most of this time he was the sole recruiter for the Irish Brigade. The other priest sat this time, Father Crotty, avoided politics, and acted solely as a priest. 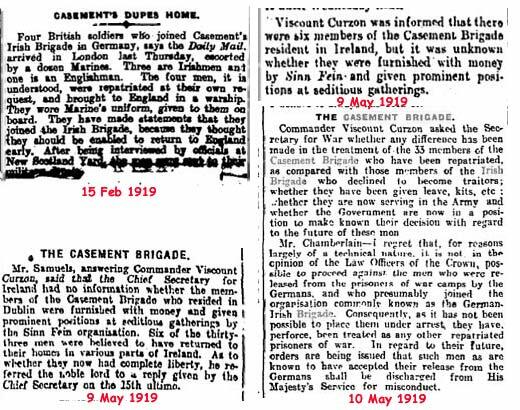 Casement made a few recruiting speeches, but in reality Father Nicholson was in sole charge of sounding out men until Plunkett arrived and the main bout of recruiting interviews took place between 9 May and 18 May 1915. Kavanagh states categorically that Casement did no actual man to man recruiting. That was done by 7 agents who worked in conjunction with Father Nicholson. The seven early men, who were active before Plunkett arrived on 7 May 1915 at Limburg and organised formal interviews of potential recruits outside the wire. Kavanagh names Keogh, Quinlisk, Dowling, O'Toole, Kavanagh, Granaghan, Delamore as the agents. He misses out Bailey, whom I think must have been one as well. Potential men were vetted against them being spies, though it is difficult to see how they might have done this thoroughly. One does not know whether a British agent joined the Brigade. 1915 Mar 20. Casement requests that Quinlisk and Keogh from among the prisoners, should be sent to him secretly in Berlin. They appear, at at this date, to be his only recruits. 1915 Apr 6, Casement writes to Count Wedel asking for some 66 named men to be removed from Limburg on the grounds that "they are Englishmen pure and simple, or wholly pro-English, and therefore hostile to the effort to form an Irish Brigade. Their removal will have a salutary affect, as they have been terrorising the well disposed among the Irish soldiers"
By early April 1915 there appear to have only been 8 men in the Irish Brigade, so it was no wonder that Casement was despondent. 1915 Apr 20. Joseph Plunkett, a friend of Casement and co-founder of the Irish Volunteers, visited Casement in Germany, and secured German agreement to supply arms to Ireland. 1915 early May. The three men, Keogh, Quinlisk and Dowling, drove to a big tailoring establishment in Berlin accompanied by Boehm and Casement, to be measured for their new Irish Brigade uniforms, which were ready for them by the time they returned to Limburg on May 9..
1915 May 9. Plunkett goes to Limburg and remains at Limburg until 1 June, so he spent three and a half weeks at Limburg, or just under half his time in Germany. Quinlisk adds "I am sure we got as great a crowd of blackguards together as any twenty regiments of the British Army could boast of. We had a few decent fellows, O'T(oole), D(owling), De(lamore) , Ka(vanagh) and G(ranaghan). This was the Irish Brigade"
If the Germans won the Germans would offer the Irish Home Rule. If the Germans lost they would be given £10 and jobs in America. Plunkett's organisation of recruiting netted about 50 men in a weeks recruiting. His diary records the daily numbers signing up, but after that volunteers for the Irish Brigade dried up. 1915 May 12. Plunkett writes to Casement "I believe that the chief reason of the small amount of influence that Father Nicholson has is due to the fact that they know he is here for a purpose"
1915 Jun 1. Plunkett leaves Limburg for Berlin. Private T. Donohoe, 11282, Royal Dublin Fusiliers stated "Sir Roger Casement addressed a large number of men in a room; the room was packed; it held about sixty. He then sent three Irishmen, who had joined the brigade, who were dressed in German uniform, only green-coloured, to speak to the rest of the men. 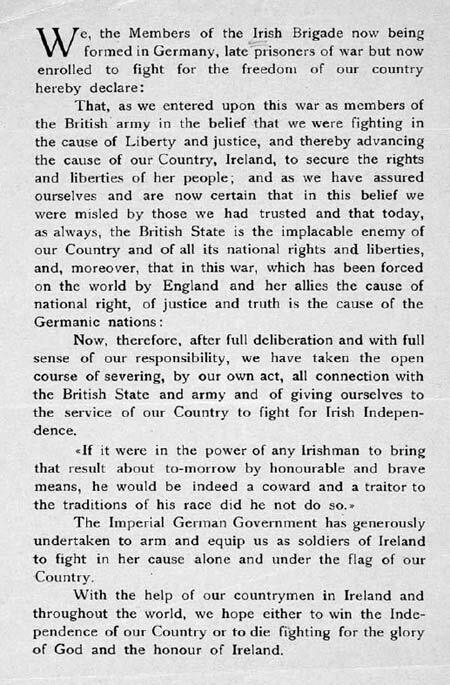 As a result of these two meetings 49 joined the German-Irish Brigade…"
From Private Joseph Mahoney In Feb 1915 Sir Roger Casement made us a speech asking us to join an Irish Brigade, that this was "our chance of striking a blow for our country". He was booed out of the camp and later returned, but did not speak to us again. We were then marched up to the Russian lines where our names and regiments were written down, out of about 800 to 900, 47 joined and were taken away. After that further efforts were made to induce us to join by cutting off our rations, the bread ration was cut in half for about 2 months. No others joined beyond the 47. In Nov 1915 they came again with 2 of the most intelligent of the 47 who were then sergeants - viz Bailey of the Royal Irish Rifles and O'Toole of the Irish Guards. No one else joined up to the time I left. Another POW stated A gentleman in civilian clothes (this probably refers to Plunkett) came to Limburg about May, 1915. Two weeks beforehand—that is to say, before his visit—everything was brightened up. The book 'My Four Years in Germany', by US Ambassador James W. Gerard, offers the following insights. 1915 Jul 7. The Irish Brigade moved to Zossen. They were meant to be billeted with 203 German Infantry Regiment, with whom they were to train. However they arrived first at Halbmondlager some 3 miles distant, a show camp for coloured POWs. 1915 July 15. ” With so few taking up the offer “ they (the Germans) determined to conclude the affair, the renegades were taken to Zossen as prisoners in July 1915.” The men of the Irish Brigade are reported by Casement to be in Zossen on 15 July 1915 and "would soon be in barracks and uniform"
1915 Aug 20. The Official German report states that the Commander of the Zossen Camp announced the arrival of 55 Irishmen, one with a broken leg (Sewell). The party included 2 sgt-majors, 3 sergeants, 6 corporals and 44 privates. The report says that the Irishmen resented being herded together with oriental prisoners, and that much dissatisfaction and trouble ensued. The report also states that these Irishmen were no longer German prisoners, but would be furnished with Irish uniforms of hunters green, and treated as comrades. They were to be trained a machine gun groups, given the paucity of numbers. They were eventually, many months later, armed with 5 machine guns, 2 trench mortars, for drill purposes and rifle and bayonet for each man, but the weapons were not given to them for many months. They got up at 6.30am and began with PT. Lectures on military subjects and sports to keep the men fit were part of the days programme. 1915 Sep. A letter from the German liaison officer, Capt H Boehm, to the General Staff on 24 Sept 1915 deals with complaints by Sgt Keogh of the Irish Brigade. Boehm believes "The Irish are housed in a very good, very well furnished barrack ...food is good and plentiful...As a consequence of various transgressions it has been found necessary to tighten up on discipline ...Sending them to work has been considered impractical because of the unreliability and lack of discipline of the men"
1915 Sep 25. Casement was drawing up contingency plans to send the men to the USA if his whole Irish Brigade enterprise had to be abandoned. A list was drawn up of where men wanted to go in the USA in the event of them being sent there. 1915 Sep 27. Casement visited the Zossen camp on 27 Sept 1915 and concluded that the men were "very well cared for .. but that they were unhappy and felt themselves useless ... they are without personal liberty at all"
1915 Oct 25, Colour-Sergeant Keogh sent a letter to Casement in which he says "This morning Quinlisk, Dowling, Collins and Keogh were in Berlin standing trial for the affair of the Algerians money. I was present and the trial was public. They were tried as Irish Prisoners of War, and not having a Consul to plead for them, they were sentenced to a fortnight's imprisonment. Dr Lehmann, the prosecutor said that if we made the customary appeal to the Kaiser, they would perhaps suffer a money fine instead of imprisonment" Casement had a bad tempered exchange of letters with the Germans as a result of them being tried as "prisoners of war" and refused to appeal. A little later he agreed to an appeal, but at that point the matter disappears from his correspondence. 1915 Oct 26. Before Monteith arrived, Casement had mentioned a number of men as possible commanders, but he was not able to attract any of them, and in the end Monteith was the best he could get. Casement had previously been given the name of George McCormack as a possible commander if the Irish Brigade. He is described as a naval reserve man of Green ?, Co Derry. Nothing ever came from this contact. Casement wrote from Amersee to Henry J Reilly, in 17 Aug 1915 , a US War Correspondent working in Germany, asking him to become the leader of the Irish Brigade. Reilly later declines the offer. In the end it was Monteith who got the job. Monteith came from the IRA in Ireland, but had only been a Corporal in the British Army. He was not a good choice as commander of the Irish Brigade, as he had neither the military standing to deal with the German War Office; nor the ability to recruit, train and command the Irish brigade in the field. Monteith had arrived in Berlin a few days earlier and Casement took Monteith to Zossen on 26 Oct 1915 and introduced him to the men as the new commanding officer (or until such time as a more senior officer arrived from America). 1915 Nov 2. 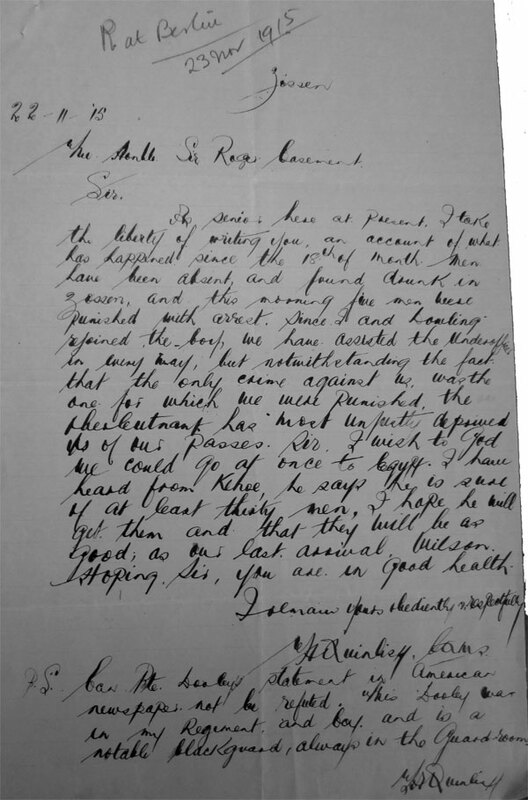 Monteith writes to Casement from Limburg on a suggestion that Sgt Keogh be sent to Limburg from Zossen to help with recruiting "Regarding Kehoe, I am rather in doubt in this matter, I have learned that there are other attractions in Limburg for the Sergeant Major beside recruiting, but he might be able to help things along... up to the present we have little to show for our work, I have interviewed 70 men, about 10 of whom I intend to see again.. the first 25 were inclined to be a bit rusty and insolent ..the men I saw today were of a far better frame of mind ... I think we stand to get 8 or 10 of them. In fact he only got 1 man from all this effort - Wilson. One has to conclude the Monteith was not a persuasive recruiting officer. 1915 Nov 18. Quinlisk and Dowling return to Zossen from their spell in prison. They are deprived of their passes on their return. 1915 Dec 3. By the autumn of 1915 the Germans had all but abandoned any plans they might have had for a military invasion of Ireland. Casement and Monteith decided to "consider striking a blow at England... by joining the army for the invasion of Egypt and helping to free another small nation". When Casement and Monteith put this idea to the 56 members of the Irish Brigade on 3 Dec 1915, only 38 were willing to volunteer to serve in Egypt. The Germans reacted to this rebuff by deciding to again treat the Brigade as normal prisoners of war, which in turn caused 24 of the 38 to retract their offer to serve Germany in Egypt. At this point Casement fell ill to health problems and withdrew to a sanitarium in Southern Germany in December 1915. Monteith was now in sole charge of the Irish Brigade. 1915 Dec 14. An article about the Irish Brigade with a photo of the sergeants in uniform and signed by the senior NCOs was published in the USA. This did not help the men, as British Intelligence appear to have used the photos to identify men and to stop allowances. 1916 Jan 1 The Irish Brigade football team played 203rd Brandenburger Regiment. There was a musical celebration afterwards, but heavy drinking led to fighting between the Irish and the Germans. The result was that Keogh had to fire a revolver into the ceiling to calm the fight. The camp commandant confined the Irish and the Brandenburgers to barracks for two weeks as a result. 1916 Jan/Feb/Mar. Keogh records that the men continue with machine gun training. Monteith ran out of enthusiasm to keep up his daily diary. His entry on Jan 14 records that he is not up to his job. He gives up his diary on 16 Jan. As far as one can see both Casement and Monteith have been broken by the experience of trying to run the Irish Brigade. 1916 Mar 1. Monteith was summoned to General Staff in Berlin and was told of the Easter Rising and the German arms that were to be sent by sea to Ireland. Monteith informed Casement, who was sufficiently motivated by this news to leave his sick bed for Berlin. The Germans wanted to send Casement and all his 56 man Brigade to Ireland with the weapons, so ridding themselves of both Casement and his men. There were a few weeks of bad tempered negotiations between Casement and the German General Staff, as Casement thought the proposed Rising in Ireland was futile and did not wish to send the Irish brigade. Finally, and it is not clear why, the Germans agreed to provide a submarine to take Casement, Monteith and Bailey ( a sergeant in the Irish brigade) to Ireland ahead of the ship, the Aud, carrying the arms. By the time the Aud and the submarine left Germany, British Intelligence knew about it. The broken German codes gave them the information, but it was badly given to Dublin Castle or anyone else as they did not want to compromise their source. 1916 Mar 3. Casement was still abed in Munich when he received a letter from Monteith, asking him to come to Berlin at once. He replied that he could not move, and so Monteith therefore travelled to him on 7 Mar and told him that a few days earlier a Lieutenant Frey, of the General Staff, Political Section, had sent for Monteith and told him that they had received a message from Devoy in the USA that needed attention. 1916 Mar 16. Casement went himself to Berlin and had an interview with Captain Nadolny and two other officers of the Political Section of the General Staff, who told him that the German Admiralty had declined to furnish a submarine to take Casement to Ireland; that Devoy had asked for trained gunners ; that instead of 100,000 rifles only 20,000 could be sent, together with 10 machine guns and 5,000,000 cartridges. Captain Nadolny asked whether Casement would be prepared to take the 56 members of the Irish Brigade in Zossen back to Ireland by ship. To this Casement objected on the grounds that it was highly improbable that the whole body could be trusted to fight. 1916 Mar 19. 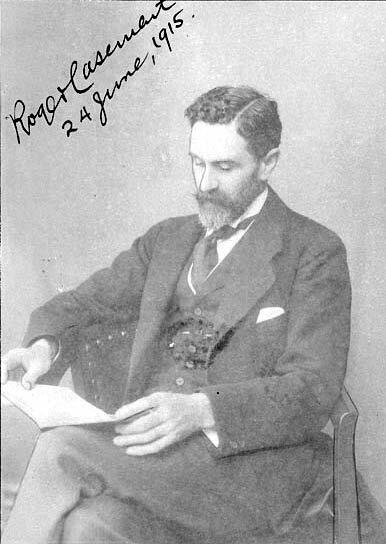 After thinking things over, Casement called at the German Admiralty to ask why it was impossible to send a submarine, and on learning that the objections were technical he suggested sending a messenger over to Ireland to give accurate particulars of the local plans and the scheme for landing the arms. It happened that in the previous November one John McGoey had come over from the United States as a volunteer, and Casement proposed to use him as the messenger. The German Admiralty approved of the suggestion, and on Sunday, 19th March, McGoey was sent into Denmark with instructions to reach Dublin without delay. McGoey then disappeared off the face of the earth. The Irish Brigade believed that McGoey had been taken off a ship by the British and shot, but no British record exists of this. McGoey may have been a German agent, or a British double agent. Having made these arrangements Casement returned to Bavaria. As he said afterwards, he felt himself under no obligation to the German Government. He maintained that in the Treaty of 23rd to 28th December 1914 that it was stipulated that "should the Irish Brigade be sent to Ireland, the German Government would support its dispatch with adequate military support of men, arms, and supplies"
1916 Mar 20. Casement returned to Berlin very much concerned about his responsibility towards the Irish soldiers. As he expressed it, "They had committed treason under a distinct and formal promise". When he next called again upon Captain Nadolny, on Mar 29, the German accused him of a breach of faith in having sent McGoey to Ireland without consulting him. 1916 Apr 11. The the 3 men set off in the U-20 bound for Ireland, but technical problems forced the submarine to return to port. They transferred to the U-20 and set off again on 15 April 1916. The submarine reached Tralee Bay in Kerry on 21 April. The reception committee from the Irish failed to materialise. About 2 a.m., Robert Monteith, Bailey, and Casement climbed into a small boat for the trip to shore. Their boat capsized before they reached Banna Strand, near Tralee. Monteith helped an exhausted Casement to safety on shore. Leaving Casement at the ruins of McKenna's Fort, Monteith and Bailey headed for Tralee. About 1:30 p.m., Casement was discovered by two Royal Irish Constabulary officers. Bailey was captured soon afterwards. Unlike his two companions, Monteith avoided capture, and in December 1916 Monteith was finally able to make his escape to New York. Casement and Bailey were put on trial for treason. Bailey turned Kings evidence and within weeks was back in the British army, posted to East Africa. Casement, as is well known, was hanged in August 1916. Following Casement's capture, Basil Thomson first interviewed him at 10 o'clock on Easter Sunday. He walked into the room rather theatrically a tall, thin, cadaverous man with thick black hair turning grey, a pointed beard, and thin, nervous hands, mahogany-coloured from long tropical service. His forehead was a network of wrinkles, his complexion deeply sunburnt. I told him that we were aware of his efforts to recruit Irish soldiers from internment camps to fight for the Germans, and he said that he had not recruited them for the German but for the Irish army ; that the Kaiser's proclamation to the Irish was conditional on an Irish army being enrolled and, as to the oath of allegiance, many great Englishmen had had to break their oath for the sake of their country. He himself had never taken an oath of allegiance, but if he had it would not have weighed with him. With the failure of the Easter Rising and the capture of Casement in Ireland, the Germans ran out of any remaining enthusiasm for the Irish Brigade affair. Two weeks after Casement's capture, the Irish Brigade lost their dozen machine guns and their 12 soldier/instructors from the Prussian Grenadier Guards were sent back to their unit at Spandau, Berlin. Keogh apparently carried on running the Irish Brigade, but it was now marginalised by the Germans. Casement himself wrote just before he left for Ireland "I think the best thing to do could be to put them to some useful occupation here in Germany till the war is over, and then to send them to America where Father Nicholson is already doing what is possible to provide for their future there". Casement also drew up a list of the men and their skills, presumably to enable this plan of useful occupation to be put into effect. 1916 May 8. Dept IIIb relinquished their part of responsibility for the Irish Brigade. The Foreign Ministry wrote to the War Office for suggestions as to the future employment of the contingent. 1916 May. As well as the WO161 series there are also a number of documents in the Special Series (WO 141). The file WO 141/9 includes a summary of the evidence compiled by MI5 of the men and NCO’s reported to have joined the German/Irish Brigade. On 9th May 1916 the Assistant Financial Secretary wrote saying all payments from Army Funds for 6 men were to cease and no credit owing to them was to be paid. On 25th May 1916 the Prisoners of War Help Committee identified 12 men as having joined the Irish Brigade and wrote to the Care Committees of the relevant Regiments telling them not to send parcels for those men. 1916 Jul 3. Having stopped military training for the men, the Germans sent the Irish Brigade to a camp at Danzig Troyl on 3 July 1916. There was a bill from the German military for 1000 marks for "barrack damages" when they left Zossen. By now Keogh's assessment of their quarters at Zossen was that they were "a venerable rat burrow", with the wooden supports and floors gnawed through by the rats, and that was the main reason for the "barrack damages". After some discussions with the Germans it was agreed that only 50 marks needed to be paid, and that for bedding deficiencies. Arriving at Danzig there were arguments with their German guards as to the terms of their imprisonment. Eventually it was agreed that the NCOs could wear sidearms, and the men belts when in uniform. But soon most of the Irish soldiers went out to work in farms or businesses in the surrounding area of Dirschau and other towns along the Baltic Sea. At this point the Irish Brigade dream had gone. Whilst at Danzig 12 of the men (I have not been able to find a list of the 12) petitioned to be reinstated as ordinary Prisoners of War. Basically the Irish Brigade, which only achieved 56 recruits at its peak, faded quietly from history, without anyone ever writing the epitaph. From July 1916 to the end of the war in November 1918, they appear to have had the lot of other British prisoners, working in German factories and farms, without any major incidents. Keogh glosses over the ignominy of this in his memoirs. When they arrived at Danzig, according to the report of an escaped Russian POW, they were housed in a specially constructed barracks in the middle of the platz. They wore their special green uniforms. The Russian records that the 2 Sgt Majors and 3 sergeants were armed with pistols and swords, but that the rest of the men were unarmed. All the Irish were free to leave the camp and to take transport to town. The Russian describes an incident in the parcel distribution department where he was working when an Irish NCO (Keogh from his description) drew a pistol on a German soldier who was impolite to him. The incident was reported to the camp commandant, but no action was taken against Keogh. 1916 Sept. However after two months the NCOs arms were taken away, and the men were no longer free to leave the camp. They now went to civilian work in town, in civilian clothes, but slept on the transport. Things started to go downhill for the Irish. They were neglected by the Germans, their clothes became ragged, they were unshaven, they were fed the same food as the Russian prisoners, and they became despondent. 1916 Oct 8. The British Foreign Office was informed the that the rule of discipline among the Irishman had broken down and that theft, burglary, drunkenness and non-compliance with service regulations has become the norm. Basically they remained in the Danzig area for the next two years, some doing various labouring jobs in the surrounding area, some remaining in the camp. They went by train and road until they found themselves in a hut built near a river at Quadsow (now Kwasowo in Poland) in a wilderness. Quadsow was a punishment camp. This was their home. They slept on damp mud and the walls of the hut were damp. They worked from dawn to dusk, reinforcing the banks of the river. All they ever had for meals were hot drinks, no food. Two months later 5 of these men returned. Their appearance had changed, they were now bearded and pale, their eyes full of fear, their bodies bloated from hot drinks but no food. They had been bullied by the guards and butted with rifles. Later that evening of their return Rahilly found that one had cut his own throat with a rusty razor. He made a recovery, but not a full recovery, and died later in 1918. This man has to be Gunner Carr as he is the only man whose death fits - 15 Sep 1918. O'Toole wrote to Keogh I disassociate myself from sending them to such a place of torment as Quasdow has proved to be. I think a man should not be punished twice for one offence and such punishment - starvation, underground dwelling bugs and worst of all hopelessness. Most of them are Irishmen and I am sorry to say it is Irishmen who sent them to that Hell on Earth. The episode effected the morale of all the Brigade. They feared being removed to the punishment camp meant that few dared to speak to any of their comrades for fear of being denounced for some reason. "Often men would not speak a word during the day, but sat watching their comrades across the room, always watching each other, always each other for none knew who the informers were. " 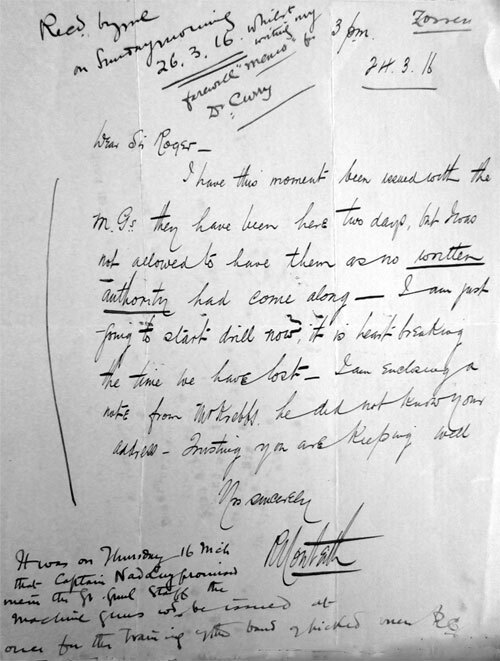 They formed their own secret society to counter the threat of informers and from this they sent word to one of the sergeants (this is probably O'Toole, as it was he who wrote to Keogh about the situation) of the danger of the whole brigade breaking down under the threat of informers and Quadsow. For some reason this solved the problem, and they were able to talk freely again without the punishment camp hanging over them. 1917 and 1918 passed mainly with men working in the area around Stolp or Dirschau (where Quinlisk says there were 15 from the Irish Brigade). On the whole they seem to have formed their own groups, and had little to do wit the camp at Danzig. Only a small group remained in camp - those who could afford not to have to work. A number died in Germany, Holohan of natural causes 1915, P Carr died 1918 apparently after complications from a failed suicide attempt, Scanlan shot in German Revolution in Feb 1919, P Sweeney stabbed to death near Munich by another Brigade member in a fight over money. 1919 May 10. The British Government offers a figure for 33 men repatriated by this date, and that 6 of these were living in Ireland at that time. It appears the British Army would only discharge under the grounds of misconduct, men who had accepted a release from POW camp by the Germans. And there the matter seems to have rested. One can follow the lives of some of the men after the war, but they were acting as individuals, rather than as a group. Some suffered violet deaths in Ireland soon after returning. Quinlisk shot by IRA in Feb 1920, J O'Callaghan shot in Mallow Barracks in Aug 1922, and McCarthy believed killed by the British in an ambush in 1921. 1924 Jul. In a letter to the Irish Government, Keogh says that his life was in danger from a plot by "three ex-prisoners of war who were in Germany". But it is not clear if these were Irish Brigade men or not, but I suspect that it was some of the men sent to Quadsow punishment camp, who were after vengeance. Keogh had already reported while at Danzig, that he had to leave that area once because he was being threatened by Quadsow men. 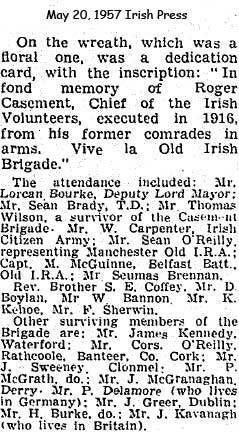 1935 Apr 4 A reference to O'Toole and Kavanagh at a meeting of surviving member. 1957 There was a memorial mass for Casement at Dublin Castle. 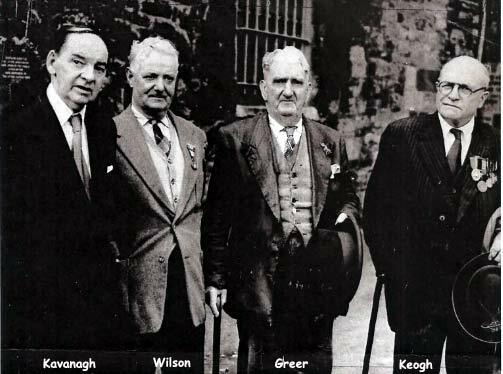 Among those present were M. Keogh, Kavanagh, Greer and Wilson.